Marvel’s Agents of S.H.I.E.L.D. today revealed the synopsis for the upcoming premiere for the 5th season of the super-spy series. Of note, the Ghost Rider aka Robbie Reyes (Gabriel Luna) is set to be featured this season, but will break out in the first episode. 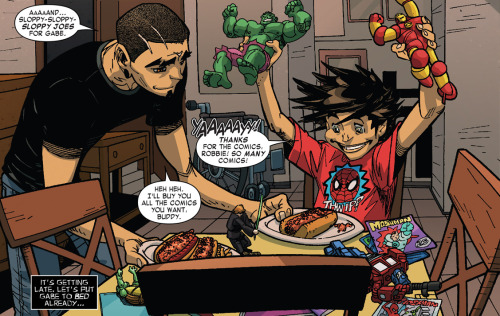 Today, Marvel also revealed that Robbie’s brother, Gabe, would indeed have a role in the show. Its Gabe, here played by Fear of the Walking Dead’s Lorenzo James Henrie, who is Robbie connection to the Earthly world. Robbie gained his power as the Ghost Rider from his estranged uncle, Eli Morrow, a Satanic serial killer who kidnapped and murdered at least 37 people in Satanic rituals before he is gunned down by the police. Eli was also the one who pushed Robbie and Gabe’s mother down the stairs while she was pregnant, causing Gabe’s paraplegic condition. “Marvel’s Agents of S.H.I.E.L.D.” stars lark Gregg as Agent Phil Coulson, Ming-Na Wen as Agent Melinda May, Chloe Bennet as Daisy Johnson, Iain De Caestecker as Agent Leo Fitz, Elizabeth Henstridge as Agent Jemma Simmons and Henry Simmons as Agent Alphonso “Mack” MacKenzie.